Roland have updated their celebrated electronic drum kits with an improved brain and their patented Supernatural Sound technology. Last year, I reviewed the TD20XK, the flagship model in the industry-standard range of V-Drum kits from Roland. Other than the fairly hefty price tag, it was hard to find anything not to like about the TD20XK. In fact, it would be hard to imagine how you could improve on what was widely regarded as the best digital drum kit on the market... but Roland have decided to try anyway. Heading up a complete revamp of the V-Drum range are the TD30K and TD30KV kits. Both based around the same all-new TD30 brain module, featuring the impressive-sounding Supernatural sounds and Behavior Modeling, the two kits offer slightly different pad and rack configurations. The TD30KV is at the top of the tree and aimed more at high-end, pro use, with its industrial-build rack, additional tom pad and optional shell wraps. The TD30K, meanwhile, is a slightly scaled-down version of the TD30KV featuring standard Roland V-Drum pads and cymbals and a more lightweight rack. The latter kit is perhaps more suited to the studio environment or less rigorous live work, and is the one supplied for review. Shipped as a standard five-drum kit, the TD30K comprises three 10-inch PDX100 toms, a 12-inch PD125BK snare and the KD120 12-inch kick drum, which is a freestanding unit with two hefty adjustable spurs to keep it in place on the floor. Three cymbals are provided: a 12-inch, dual-zone CY12C crash with triggers on the bow and edge of the cymbal, plus the facility to choke the cymbal by grabbing it at the edge; the 13-inch CY13R, offering three trigger zones (bell, edge and bow), and a 15-inch CY15R model, which has selectable dual triggering — either edge/bow or bow/bell — and is suited more to use as a dedicated ride cymbal. The set is completed by the VH11 Hi-Hat, a single 12-inch cymbal that mounts on a regular hi-hat stand (disappointingly, not provided with the kit!) and works in conjunction with a fixed lower base that gives the motion of a regular pair of hi-hats. The cymbal pads comprise a hard plastic body with a rubberised coating that gives a more natural playing surface. 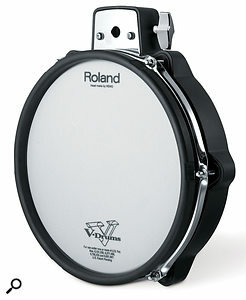 All the drum pads use the standard Roland mesh heads that appear in one form or another on almost all the V-Drum kits. Developed in conjunction with the most famous drum-head manufacturer in the world, Remo, these multi-layer mesh heads can be tensioned just like a standard drum head, to give you as close to a natural feel as possible, but without the acoustic noise. Although not quite the top-of-the-range offerings supplied on the TD30KV (featuring a new, improved rim sensor for heightened sensitivity), the pads on the TD30K are close to those offered on the TD20XK I reviewed last year. They may not offer exactly the same triggering ability as their more elaborately designed KV counterparts, but they are more than capable of taking advantage of the new features of the TD30 module. All the pads, TD30 module and cymbals, with the exception of the hi-hat and kick drum, mount on the new MDS12V rack system. The rack comes completely pre-assembled in the box, with all the tom mounts and the cymbal arms already in place on the frame. It unfolds like one of Michael Bay's Transformers, its beautiful black and chrome looks, with glimpses of cables and weapon-like cymbal arms, adding to the futuristic look. The cable loom that connects the pads to the TD30 module is already routed through the tubular frame, with the jack plugs appearing at appropriate places around the frame. Luckily, unlike the Transformer toys, I didn't need my son to work out how to 'transform' it into its usable state. This was a big plus point for me, having spent many hours on my studio floor assembling racks, surrounded by bespoke tools, drum keys and screwdrivers, like some kind of IKEA-sponsored horror movie! The TD30K snare is mounted on the rack via its own 'arm', rather than on a standard snare stand like the TD30KV and TD20XK. I initially thought this might make the drum difficult to position, but having reviewed quite a few kits where this is the case, I've yet to find a problem. The TD30V was no exception, with the snare sitting exactly where I wanted it. The whole rack, although positioned by Roland as a lighter-weight option, feels very solid. The pad mounts, connectors and cymbal arms are substantial and hold everything in place perfectly, while being flexible enough to ensure that all the components can be placed exactly where you want them — and that they stay there! Three of these 10-inch PDX100 heads do service as the TD30K's toms. By the time the TD20XK kit was released, the TD20 'brain' module had seen a couple of upgrades to keep it ahead of the game, but technology marches on pretty quickly and it was starting to lack some of the features, like USB connectivity, that newer units such as the SPDSX were sporting. The TD30 is completely new, and although it includes much of the same look and functionality as its predecessor, it also has quite few new tricks up its sleeve. The overall layout of the front and rear panels is almost identical to the TD20X, with dedicated inputs for all the pads, plus an additional four aux inputs. Again, there are eight direct outputs in addition to the main left and right, which make recording individual drums a breeze, as each kit's individual sounds (kick, snare, toms, and so on) are pre-assigned to their own output. The Compact Flash card slot has been replaced by the now-ubiquitous USB memory socket (which I'll come to later), and a further USB socket has been added for connecting the TD30 directly to a computer. Although it's a welcome addition, the USB/computer port connectivity is limited to transferring MIDI and audio data directly between your computer and the TD30 (rather than offering any on-screen editing or management functions), with the module acting as an audio-MIDI interface. I was a little disappointed to see only stereo audio, mirroring the main outputs of the TD30, as it would've been nice to have individual audio from each drum available in my DAW. Like its predecessor, the TD30 module has a good few knobs, faders and buttons. Joining the Group Faders, used to control the individual level of each drum, backing track and click, is a new Ambience fader, which applies a global ambience to the selected kit. Anyone who's had experience of the ambience features on previous Roland V-Drum modules will know that there's no shortage of editable parameters. Pressing the dedicated Ambience button brings up an edit screen that allows you to create an acoustic space. Overhead mics can be placed in one of seven different virtual positions, from low through to high, with variable width between the stereo pair. The room setting can be anything from a beach to a bottle (with 25 more 'normal' options in between), each with an almost limitless size, shape and 'wall type'. Room-mic position can also be set, including the interesting option of 'Next Door'! You can also set a reverb to add to the natural ambience. The Sequencer section has been renamed Song Player and its controls relocated to the top left of the module. The TD30's MIDI-sequencing capabilities are pretty much as they were on the TD20: a six-part sequencer with a Drum Kit part, Melody part, Bass part, Backing 1 part, Backing 2 part, and Percussion part. There are 100 preset patterns and 100 user Patterns, with Presets featuring play-along songs and also sequences that are triggered by hitting pads in some of the preset kits. 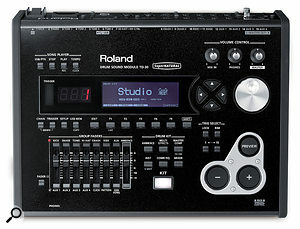 In addition to MIDI sequencing, the TD30 can play back MP3 and WAV files via a USB Flash drive connected to the module. In Song Player mode, you can simply switch between the built-in pattern sequencer and USB drive via one of the function buttons under the display and, using the +/- key or data-entry dial, select an audio file to play. A second function button brings up the Song Info/Func screen, where you can set the type of playback (loop or one-shot), along with the song volume. One of the main uses of the audio playback is as a play-along tool for practice, and the TD30 offers a couple of very useful features to help with this. The speed of the audio can be adjusted (without changing the pitch) between 50 and 150 percent. This is done in real time by turning the data-entry dial, which is very handy for finding exactly the speed you're looking for. As with any digital audio manipulation, the quality of the audio file will change depending on how far you adjust it away from its regular speed, and different audio files will work better than others. Another neat feature to aid your practice regime is the ability to repeatedly play back a specific region of a file. While the song is playing, simply use two of the function keys to specify a start and end point and that section will loop around until you stop playback. The new TD30 brain module is what really sets the TD30K kit apart from its predecessors. Notwithstanding the new feature additions, the biggest difference between the TD20 and the TD30 is how the new module's kits play. Each one of the 80 preset kits offers something inspiring, whether it's the enhanced realism of the acoustic kits or the unique familiarity of the 808 and 909 electronic kits. Acoustic kits form the majority of the presets, which I was particularly pleased about because, for me, that's what the V-Drum kits do best. The snare drum, in particular, is just amazing in how it responds to the lightest of grace notes. The positional sensing has also been improved, giving greater emphasis to exactly where the drum is struck. The difference between hitting the drum in the middle of the head, on one hand, and close to the rim, on the other, feels as close as you could get to a real drum and the transitions in between are incredibly smooth. The dynamic range is huge, giving the drums a very natural and realistic feel. The toms are equally impressive, with the tone changing very subtly as you strike the drum harder, but with each drum reacting in a slightly different way, as they naturally would. Although not as satisfying to play as the mesh-head drums, the cymbals do have great sensitivity and respond to even the lightest touch. Having up to three zones (edge, bow and bell) makes these cymbals surprisingly natural-sounding. As you move between the zones with your stick, the sound changes gradually and evenly, which is both impressive and a little disconcerting at times when you realise you are actually hitting a piece of plastic! They even have the ability to choke if you grab the cymbal as it 'rings', but at the end of the day they do fall a little short of the real thing for me, in terms of both sound and feel. That's not to take anything away from the cymbals — they are very impressive and would sit perfectly well in a mix, being almost indistinguishable from the real thing to the average listener — but for a player they still don't give quite the same feel and sound as regular cymbals. The hi-hat does the best job of all the cymbals. Although not quite as advanced, in terms of look and feel, as the dual cymbals of the VH13MG featured on the TD30KV, it's still pretty impressive. Moving from closed hi-hat playing to open hats is smooth and natural-sounding, and the dual-trigger cymbal adds to the realism, enabling you to play on the bow or edge. All this is primarily due to Roland's new Supernatural Sounds and Behavior Modeling Technology, which I've attempted to explain in a little more detail in the box. Like its predecessor, the TD30 offers the incredible V-Edit features, which allow the size, shape, material, head type and a list of other aspects of each drum to be edited — and you can now apply EQ and compression to each drum individually. The TD30's back panel is packed with connections and offers direct outputs for each drum. New to this model are the two USB ports for a memory stick and connection to your computer. Electronic kits are certainly not to every drummer's taste and won't suit every situation but, as I originally said in my review of the TD20KX, the ability to create almost any kit you can dream up and place it in almost any acoustic space is an amazing tool to have at your disposal, particularly in a recording environment. Roland's Supernatural Sound and Behavior Modeling technology take this kit to a new level, in both sound and playability. The subtlety, dynamics and level of realism that can be achieved are quite remarkable and make the TD30K an absolute joy to play. For me, this kit is about as good as it gets. I've been fortunate to have reviewed a number of electronic kits, many of them top-of-the-range products with top-of-the-range prices to match, but the TD30K, although not cheap at $4499£4200, brings together an almost perfect combination of build quality, features and playability. Not having played the flagship TD30KV, it's impossible for me to tell if it warrants the extra £2500$3000, but I find it hard to believe there's anything like a corresponding level of difference in performance between the two kits. Although the TD30K isn't using the newly developed pads, it is based around the same TD30 module, and for me that is where the real magic happens. 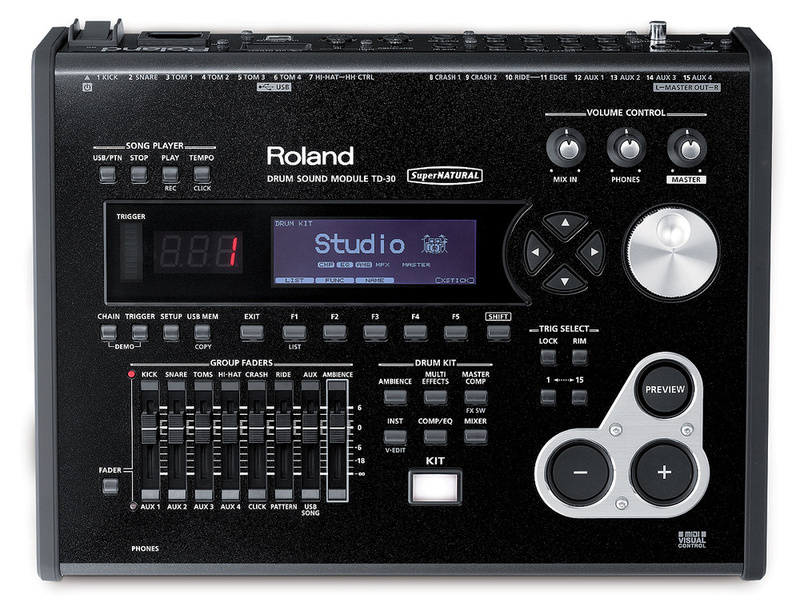 Broadly equivalent to Roland's TD series is Yamaha's DTX range, which likewise offers a number of kits to suit different budgets, such as the DTX950, DTX900 and DTX750. Roland too have a broad selection of kits available, so it's worth checking out the rest of the V-Drum range. 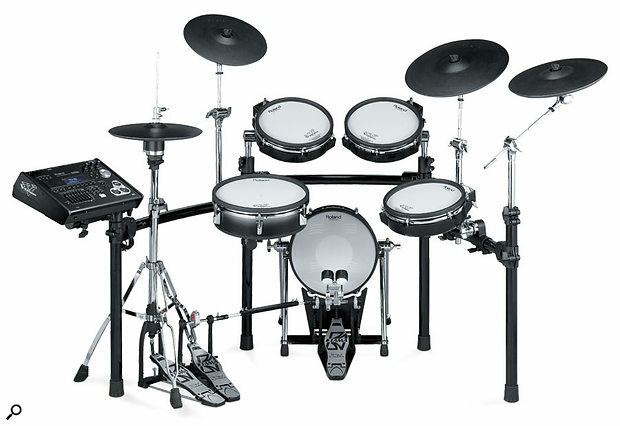 Of course it's not just about the Japanese giants: there are also plenty of electronic drum kits available from other, lesser-known manufacturers such as the MarkDrum YES1 or the 2Box DrumIt 5. The new TD30 brain module is the first to feature Roland's 'Behavior Modeling Technology' and 'Supernatural Sound'. This Supernatural technology has been appearing in Roland products for a while now. Initially introduced in a number of digital pianos and, more recently, in the Jupiter 80 synth, it's intended to increase the realism, in terms of sound and expression, of digitally emulated traditional instruments. Still based on PCM samples at its heart, the Supernatural engine controls how each sample reacts to performance dynamics and nuances in technique, such as where on the drum head the stick actually lands. Unlike techniques such as velocity switching, Supernatural Sounds respond more smoothly to changes in your playing style without any 'stepping' between different samples, making both sound and the way the instrument responds to your playing as, well, natural as possible. Behavior Modeling technology takes this a step further by modelling the sound of the drum as it is being played. For example, the vibrations created when playing a fast roll ultimately affect the sound of each successive strike; or, in the case of a ride cymbal, the force and location of the hit vary the tone naturally. Behavior Modeling goes some way to recreating these effects that occur as a normal consequence of different playing techniques and styles. Extremely close to the TD30KV in terms of performance. Cable loom inside the frame. The TD30K offers top-end performance without the flagship price-tag. It's not cheap, but I really do think you get what you pay for: V-Edit capabilities, new Supernatural Sounds and Behaviour Modelling are a stunning combination that would be hard to beat at any price. Roland +1 323 890 3700.